When I was grocery shopping last week, I saw something I haven't seen before in the meat section--turkey wings. Maybe I've just happened to overlook them all this time, but I'm fairly certain it was something new, or at least something only around in November. We all love turkey, so I thought I'd give them a try. 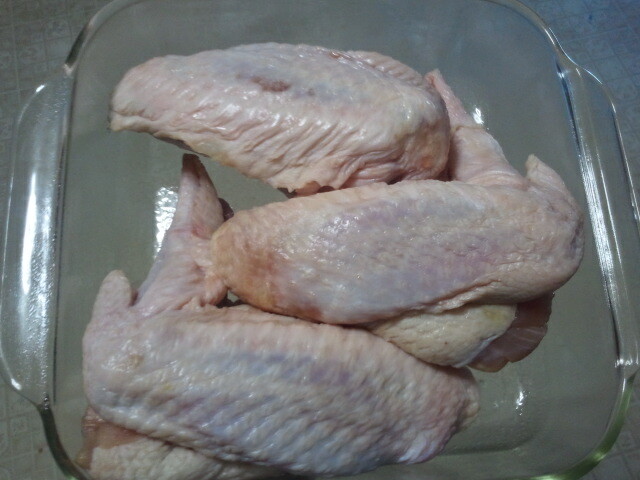 I started by spraying down an 8x8 pan with butter flavored cooking spray, then adding the wings. On the wings, sprinkle with a mixture of salt, pepper, garlic, onion powder, coriander, paprika, and parsley. That's my typical chicken wing mixture, so I figured it would work with the turkey too! Bake until internal temperature is 165. 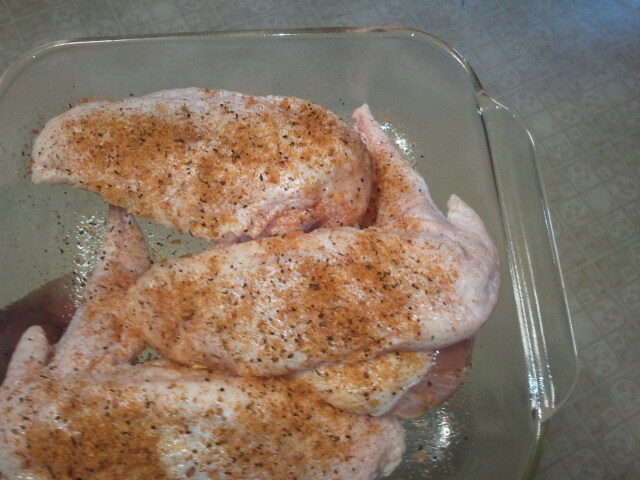 You'll want to flip them over once during the cooking time to make sure the skin on the bottom gets crispy too. I flipped them after about 40 minutes.Total cooking time for these was about an hour and ten minutes. 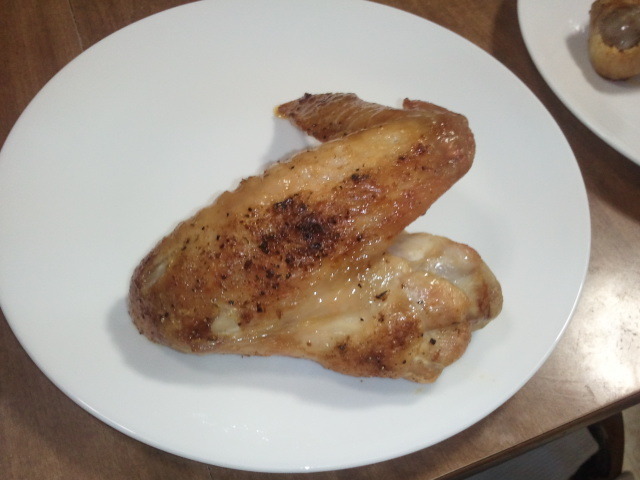 The skin was crispy and the meat was tender and juicy! 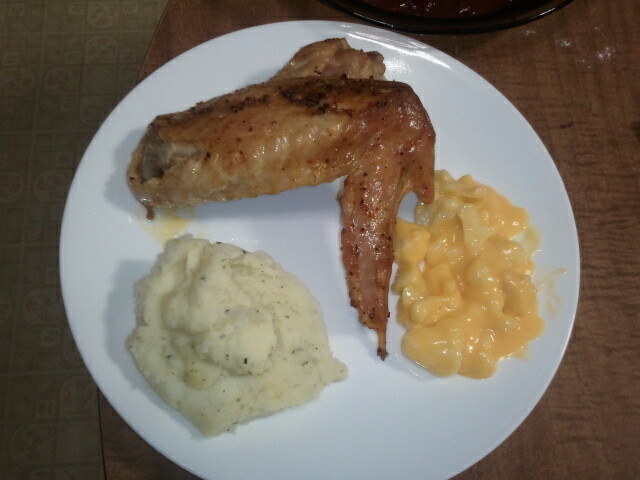 We served it with butter and herb mashed potatoes and cheesy cauliflower. Now it's time to link up all of your creations! 2. The post has to be made from scratch. Hello, Jen. Your turkey wings look delicious. Today, I shared an apple strudel recipe, a Lithuanian blynai recipe, and a Pennsylvania Dutch turkey stuffing recipe. Thank you for hosting another festive party and have a great week! 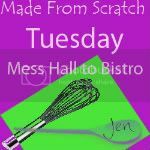 Hi Jen, Thanks for hosting another From Scratch Tuesday. I usually use wings to make a pot of stock. Wings are a cheap source of protein and flavor. Well done! I shared my Chile with Homemade Turkey Sausage recipe. Those turkey wings looked great! Thank you for the opportunity to share Buttermilk Fried Chicken, Chicken Cordon Bleu Soup and Chicken Cordon Bleu Egg Noodles. Love for you to join Thursday's Treasures. Hi Jen, It's nice to see so many Made From Scratch recipes. Thanks for hosting. This week I'm sharing my Frosted Red Velvet Doughnuts. Healthy doughnuts that are Gluten Free, Sugar Free & Vegan. Easy to bake in a donut pan or the recipe can be used for cupcakes. Hi, Jen. I shared my California roll recipe today. Thank you for hosting us and have a great day! Love all the great recipes. Thanks for hosting! Love me some chicken wings! Yum! I tried to share my carnets, twice but it isn't working...hmm. Need to try another browser maybe. Thanks for sharing on Hunk of Meat Monday. I don't think I've ever seen them, either. I'd really like to find a source for those big ol' drum sticks sometime.